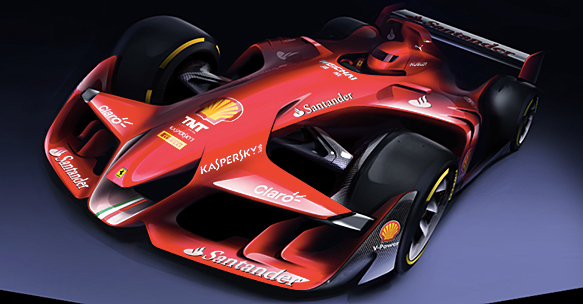 Ferrari has released images of a striking-looking Formula 1 concept car that it hopes fuels the debate about the dramatic changes the sport should be considering. Rather than pushing for any set direction of rules - such as car width, tyre size or engine capacity - the idea of the Ferrari concept car is purely to show how simple it would be to make sweeping car changes. Following weeks of work from Ferrari's own in-house design studio, in close co-operation with its F1 aerodynamic department, the result is a very futuristic looking car that still sticks to the general concept of current regulations. It features a double decker front wing and sleekly sculpted bodywork, plus a simple large rear wing. Ferrari's publication of its concept car comes just a fortnight after McLaren and Red Bull showed rival teams in a strategy group meeting concepts that they would like to see. Both teams have declined to release those images, although it is understood they are not as radical as the Ferrari car. F1 teams are continuing discussions about a rules revolution aimed at making cars faster, harder to drive and much better looking. I have to say that this looks absolutely stunning and I love the design and flow of the car that they've put into it. When Red Bull did their closed cockpit F1 car for Gran Turismo I thought it looked spectacular, but this looks so much more futuristic and stunning. Apparently both Red Bull and McLaren have done similar concepts but rumours are saying that they're no where near as nice as Ferrari's. There's a meeting today with the WMSC about the direction F1 should be going in terms of looks, dynamics, and everything and I guess this is the reason why the top three have been putting concepts together. I would love it if they started to look like that, hell I bet if the new rules hadn't come in back in 2009 cars would almost look like that now! I don't want it looking like Le Mans! This was the car I was talking about for GT, the only thing I don't like about it is that it looks like an LMP1 car. The Ferrari at least is still very akin to the F1 look with its open wheels, the rear body sweeping between the wheels, sidepods, but with a dual front wing.